For a while now I have been longing to spend more time learning all the ins and out of Power BI embedded. From the line of work that I do, I can see a number of different development applications where an embedded solution would be perfect. Microsoft has been spending more time developing and feature enhancing the embedded experience. 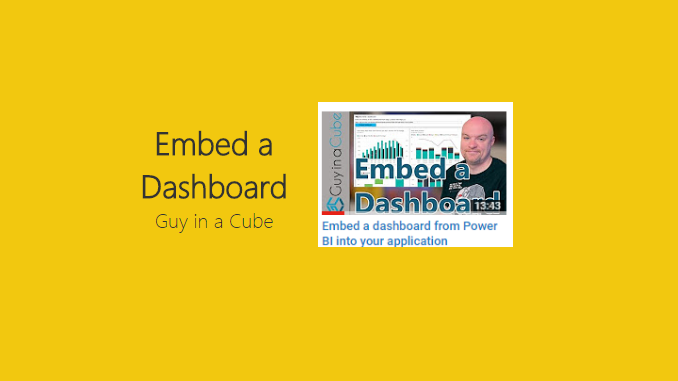 The Guy in a Cube (Adam Saxton) has another great video walking through how to embed a dashboard. Great video, and a really good walk through. Thanks Adam. If you haven’t already make sure you go check out Adam’s site and YouTube Blog for more great information.